The Sacred Heart Area School Staff is excitedly anticipating the upcoming school year. Our back to School Open House/Potluck will be held in the SHAS gymnasium on August 29th at 6pm. New families are invited to a brief school orientation at 5:30pm. 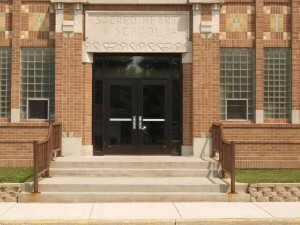 This summer Sacred Heart Area School replaced the front exterior doors and modified the interior doors of our school, for a more attractive, larger entrance and most importantly, the safety and security of its students. This was made possible by members of the community who donated to this project.